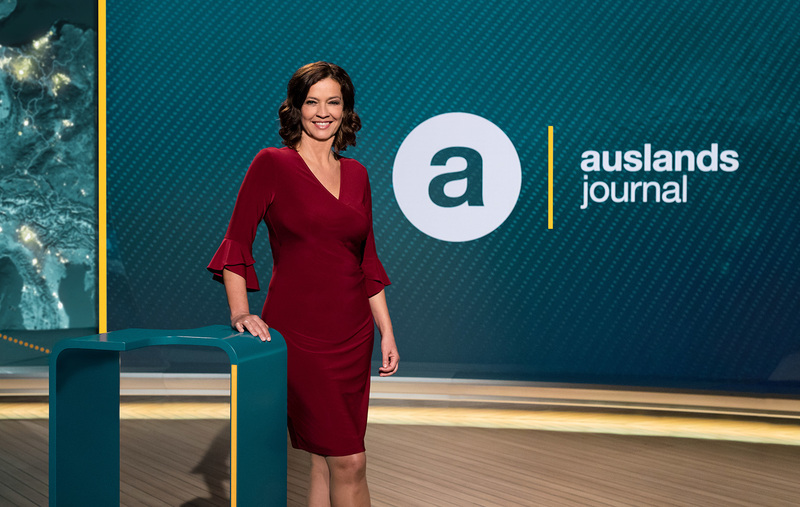 “It’s about keeping the traditional ‘Foreign Journal’ brand alive and modern, not just with a new coat of paint, new colors, a fresher look, we also want to engage audiences more directly with our stories – on TV and online,” said Katrin Helwich, the Editor-in-Chief of the program in a translated release. The new studio is described as “transparent and generous, present and approachable,” featuring a large LED media wall that will allow presenters, like host Antje Pieper, to have interaction with stories. Antje Pieper in the new “auslandsjournal” studio. Photos courtesy of ZDF. ZDF notes the new design will be familiar to current viewers, keeping design touches like wood finishes and acrylic glass elements along with the programs globe print background.